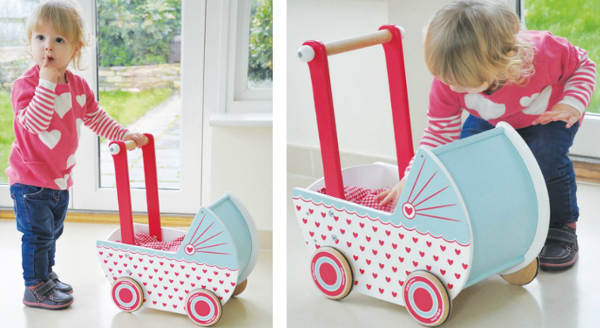 This sturdy wooden dolls pram is just heart-meltingly adorable. It would make a beautiful gift for any toddler or kids who love to play house. At one year old, my daughter’s favourite past-time is to push things around the house and collect items. She once carried a small wicker basket about the backyard and collected rocks until she couldn’t lift the basket anymore. Things that make you go naaaww. This gorgeous wooden pram from Indigo Jamm is so perfect for that stage of development where kids are first walking and exploring. With rubber-lined wheels, this pretty pram will glide across indoor floors and outdoor paths. I just adore the sweet heart pattern and pale blue canopy that gives an alternative to the various shades of pink that make up so many children’s pram designs. The Hearts Pram by Indigo Jamm can fit a doll up to 25cm in height (or a lot of rocks, if your little one is like my daughter). This brand also make gorgeous retro wooden cars that have caught our eye before. Can you tell I’m in love with their style? Classic toys done with modern fashion – it’s a winning combination. You can find the Hearts Pram at Wooden Wonderland for $119, plus shipping. They deliver across Australia.